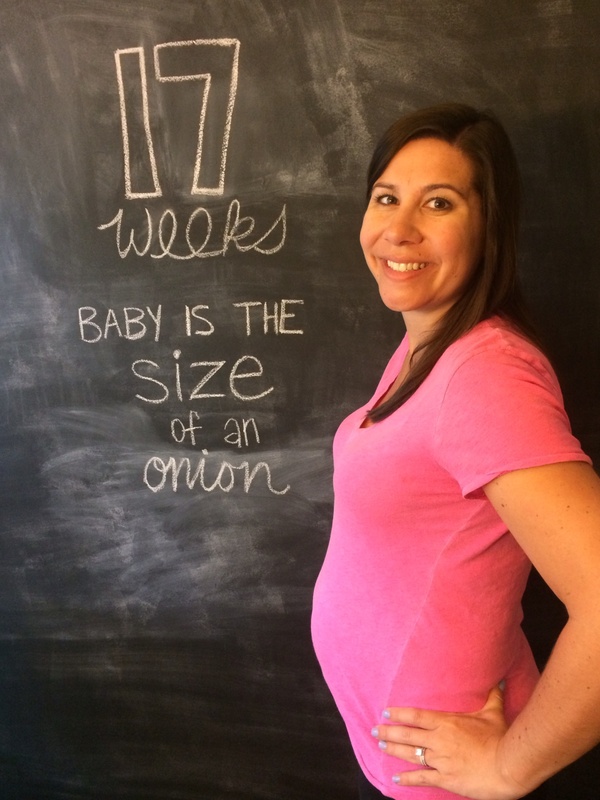 How far along: 17 weeks and the size of an onion – about 5.1 inches long and 5.9 ounces. Maternity clothes: Starting to wear more flow-y dresses as the weather warms up. Also, a sweet friend brought me some of her maternity clothes to borrow and I couldn’t be more grateful! Belly button in or out: Innie but getting more shallow each week. Sleep: Sleeping great with the exception of regular bathroom breaks. Best moment this week: We spent a long weekend at Lake Oconee celebrating one of my best friends, Jenna Ann, marrying her love Payne. The wedding yesterday was so much fun, and we had a blast dancing the night away with so many of our closest friends. Miss anything: Nope. Feeling great this week and couldn’t be happier! Movement: In very exciting news, I think I felt the baby move for the first time last night. I was lying in bed, and I starting feeling this bubbling sensation. At first I just thought it was my stomach rumbling, but then I remembered so many telling me this is what it would feel like when the baby first starts to move. I sat there quietly while this went on for about 5-10 minutes trying to figure out if that was really what was happening. It felt like bubbles and and a rippling sensation – almost like butterflies – which is exactly what I’ve read it will feel like. It’s so strange because it’s not your obvious kicking in the ribs which comes later, so I’ve heard many first time moms have no idea it’s the baby since it’s not what you expect to feel. I’m pretty positive I felt it, though, and it was amazing! Cravings: Still primarily sweets, baked potatoes, and cheeseburgers! Baby Purchases/Gifts: We got the sweetest gift last night from a good friend. It’s the elephant WubbaNub which is a pacifier with a small stuffed elephant attached to it. It’s precious. Looking forward to: A pretty low-key week then celebrating another friend at her wedding next weekend! Wedding season is officially in full force! 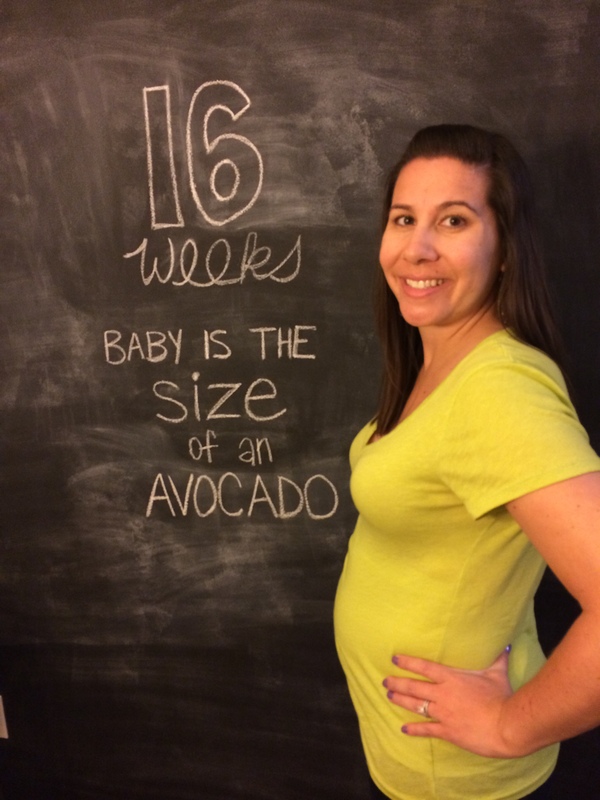 How far along: 16 weeks and the size of an avocado – about 4.6 inches long and 3.5 ounces. Maternity clothes: The bump is definitely becoming more prominent, but I’m sticking to my regular clothes still with the help of my belly bands. Happy that the weather is finally starting to warm up so that I can break out my dresses soon and sport those through the hot summer months. Sleep: Sleeping like a rock and loving my new Snoogle if anyone was wondering. Best moment this week: Seeing most of my family! My dad and Jen spent Thursday and Friday nights with us. We then went to brunch Saturday morning with them before heading to Auburn for a fun-filled Easter weekend with my mom and Andy, Andy’s mom and brother, and my grandparents. We had a blast, and it went by way too quickly as usual. Miss anything: Not really this week. I would say an ice cold beer again, but I feel like I’m starting to sound like a lush. Cravings: Fruit, fruit, and more fruit.. pineapple, grapes, bananas, apples, kiwi, you name it. Baby Purchases/Gifts: We received quite a few sweet gifts for Baby Mulligan this week from family including a stuffed kitty with matching kitty book, a stuffed lamb with sweet Easter book, a onesie repping my step-brother’s future college (William & Mary), a sweet note and donation to the Baby Mully fund, and a maternity book filled with fun facts, old wives tales, home remedies, and more. I know I keep saying it, but this is already one very loved child! Looking forward to: My 16 week appointment tomorrow afternoon. There is nothing better than hearing that sweet heartbeat! This will also be my last appointment before finding out the gender… hooray! 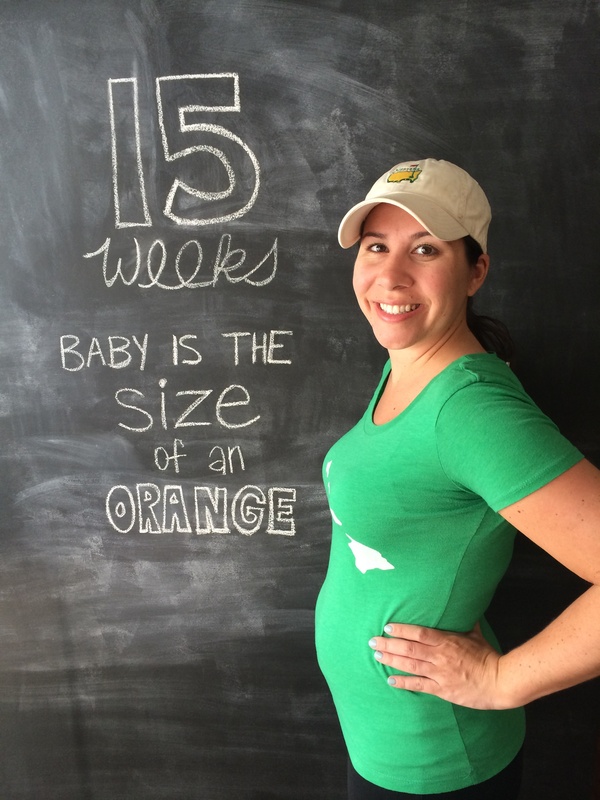 How far along: 15 weeks and the size of a golf club navel orange – 4 inches long and 2.5 ounces. Gender: Well, I now seem to be the ONLY person who feels like it’s a girl! We saw lots of good friends yesterday (many who we haven’t seen in ages), and everyone seems to think it’s a boy. Now I’m really interested to see if mama’s intuition is right on or way off track… 5 more weeks of waiting. Maternity clothes: My friend Carson who has two kiddos was kind enough to drop off her white belly band and a skirt for me to use, and I’m so thankful! I can still wear some of my work pants, but I have to use the band when wearing jeans now. I also hit up an Old Navy sale this week and bought a few dresses, a maxi skirt, and one pair of maternity dress pants. I’m planning to live in maxi dresses and skirts this summer! Sleep: Sleeping well, but now I now wake up once in the middle of the night without fail to use the restroom. Best moment this week: The best moment should’ve been all day Monday at the Masters, but sadly the weather was terrible and we didn’t even get in. Huge bummer! We’ve had a great weekend, though. Friday night we went to dinner to celebrate our anniversary a little early, and it was a great night out with the most amazing meal! Yesterday was pretty great, too – we went to two different Masters themed parties and had so much fun. Our friends hosted one at their house where they grilled oysters and we enjoyed the beautiful weather while watching golf and catching up with friends. We then headed to another party to celebrate our friend Riley’s birthday. It was a great time seeing friends we hadn’t seen in awhile, and it was such a gorgeous day to be outside! 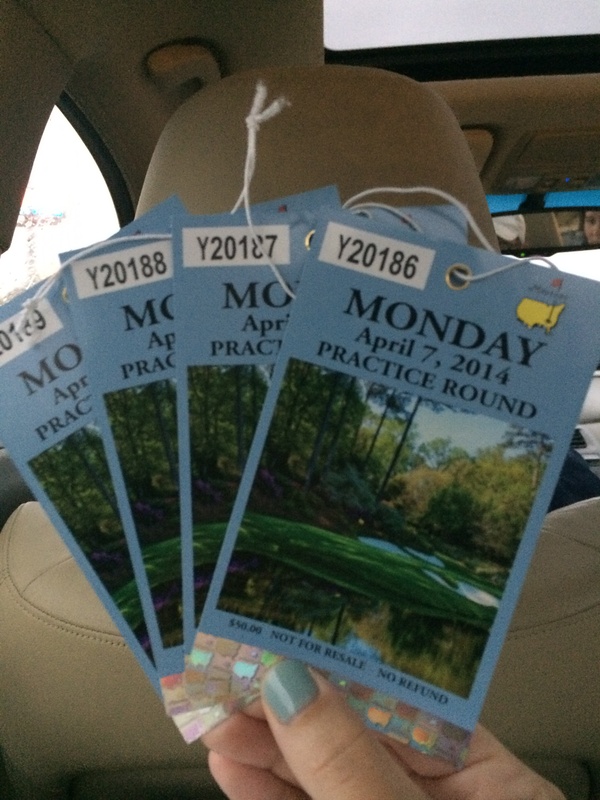 Today we are enjoying Masters Sunday at our house – Go Bubba!! Miss anything: I was missing a cold beer yesterday – and those oysters! Cravings: Mainly still tons of sweet fruit – loving pineapple right now. Sickness/Symptoms: Feeling great this week! 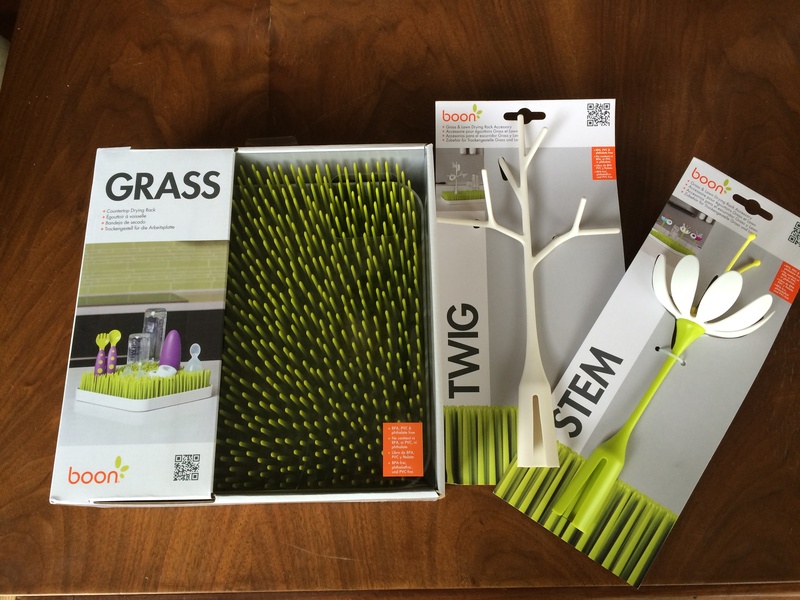 Baby Purchases/Gifts: I got a couple of pretty sweet gifts from Mike for our anniversary that I am thrilled about – the Snoogle body pillow and the Boon Grass dying rack. I never think he’s listening to me, so I was so surprised to see he had gotten me two items that were high on my list for myself and baby. 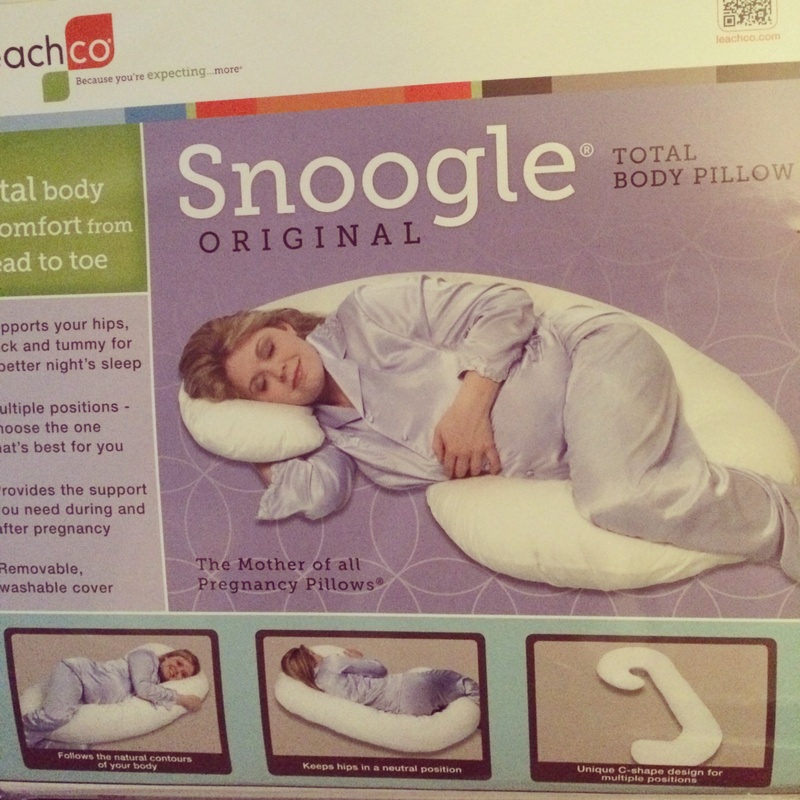 I’ve been eying that Snoogle for awhile now and have heard that it will change my life. I’ve tried it out the past couple of nights and I have to agree – this thing is amazing! My only complaint is that it barely fits in the bed with us since we have a queen. Here’s hoping Mike has been hearing my other hints (that I drop almost daily) about upgrading to a king! 😉 The drying rack he got also makes me so happy! It was love at first sight when I saw that thing, and I knew I had to have it. I just think it is so cute. Can’t wait to put it to use this fall! We also got another pretty amazing gift yesterday from our friends Adam and Lauren who have the most adorable 3 month old – they gave us the cutest green Masters polo onesie! It will be the perfect size for Baby Mulligan next year, and words can’t express how excited we are to dress him/her up for the occasion next year! Looking forward to: Our anniversary on Thursday – can’t believe it’s been 4 years!! Also, seeing my family this weekend! My dad, Jen, and Logan will be in town for Jen’s sister’s wedding, and they will be staying with us Thursday and Friday nights. We are going to brunch with them Saturday and then heading to my mom and Andy’s in Auburn for the rest of the weekend. They are hosting a fun party Saturday night on their new back porch then we will spend Easter weekend with them and my grandparents before heading back home. Can’t wait to see everyone! 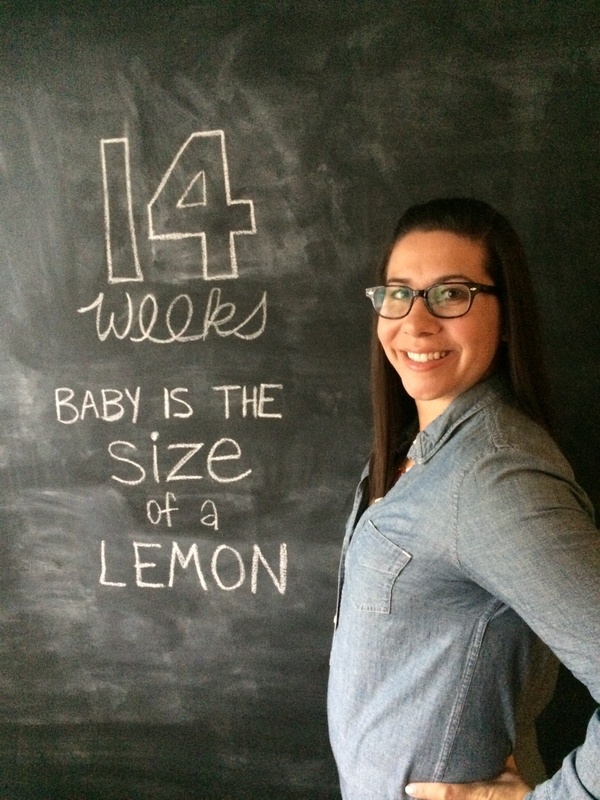 How far along: 14 weeks and the size of a lemon – about 3.4 inches long! Gender: We will be clueless for about 6 more weeks, but I still have a strong feeling it’s a girl. Maternity clothes: Ok, all of my pants were really starting to scream this week. I can zip them up, but most are much more comfortable while unbuttoned. The belly band is getting a lot more use, and I will probably be buying another one very soon so that I can have black and white in rotation. Still not ready to go shopping for maternity clothes, so I’m just at that awkward in between phase where nothing fits comfortably. Sleep: Sleeping great. I get up occasionally in the middle of the night to pee but always fall right back asleep. Best moment this week: The moment I noticed a surge in energy was pretty amazing! It just finally started returning this week, and I could not be happier. I am so ready to feel like my old self again. Here’s hoping the second trimester is much easier than the first! We’ve also had a great weekend with Mike’s family in town which included dining at St. Cecilia and Fox Bros. Yummm! Miss anything: My clothes fitting comfortably. Cravings: Still everything sweet – fruit, nutella, chocolate, sweet tea. Plus I eat at least a couple of baked potatoes a week – that’s my dinner of choice a lot of nights. Sickness/Symptoms: Forgot to mention the frequent urination last week – seriously, I visit the bathroom on average every 45 minutes to an hour. It’s crazy. Also, my appetite is out of control. I have to eat something at least every couple of hours or I start to feel light-headed. Baby Purchases/Gifts: We received another sweet gift in the mail this week from another set of grandparents – a super soft stuffed lamb that plays soothing sounds to help the babe sleep. The whale sounds are Mike’s fave.